There are many different types of paint brushes to select from when applying milk paint. There are no right or wrong brushes to use as milk paint is a versatile substance and is quite forgiving of any mistakes, so it mainly comes down to personal preference and your budget. Since milk paint comes in a powder form and must be mixed well with water, achieving the right consistency is the key to a successful painting project. At The Real Milk Paint Company, we recommend mixing one part milk paint with one part water using an inexpensive kitchen blender. Let your milk paint sit for about 20 minutes until it has the consistency of pancake batter. We recommend using any of the following types of brushes: foam, chip or oval/glazing brush. The foam brush is the most economical option; the chip brush is a good all-around brush and the oval and glazing brushes are higher-end specialty brushes. You’ll find that foam brushes are great for getting a smooth finish without any brush lines. Typically ranges in size from one to four inches. 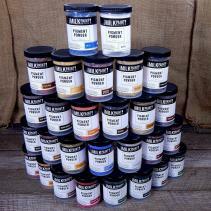 Ideal for: Water-based milk paint, clear finishes, oil varnish, Citrus Solvent and Pure Tung Oil. Avoid using with: Lacquer, shellac, and alcohol-base finishes. This is the standard paintbrush that most people use. The chip brush is a versatile and durable brush that will last for multiple projects if cleaned properly after each use. Choose from a wide variety of sizes from half an inch to 4 inches. Ideal for: Milk paint, wax and burnishing paste. These high-quality brushes imported from Italy are well-worth the extra investment. You can use these brushes with all types of milk paints and finishes for an extra-smooth look. When properly cared for, oval paint and glazing brushes can last years. Typically ranges in size from one to two inches. Ideal for: Milk paint and finishing glazes. There’s no such thing as an improper way to apply milk paint, but we find that large, thick layering of paint has the tendency to crack and fall off, so thinner paint applications work best. Some people like to use a chip brush to apply the paint and then use a foam brush to smooth out the finish and remove the brush strokes. Any natural bristle brush is prone to some shedding so go easy on them and apply light pressure when painting to avoid shedding. Don’t leave your brushes soaking in water or any type of solvent for long periods of time. This may cause your bristles to bend permanently out of shape. To clean brushes, particularly oval brushes, we recommend using lye soap which gently cleans and conditions your quality brush. Swirl your brush in a circular motion to get rid of excess paint and rinse with warm water. Blot excess water with paper towels and let it dry thoroughly before the next use. Then wrap the bristle with the canvas cloth that came with the Lye Soap. Leaving the tip exposed to the air. This keeps your brush fibers in form as they dry. Once you’ve properly prepared your surface and mixed your paint well, you really can’t go wrong when using milk paint, so get creative and have fun painting!